As the outside temperature regularly reads over 40 degrees Celsius, Australian cotton growers have again reached one of the busiest times of the season: irrigation time! With some fields that are irrigated by overhead equipment as an exception, flood irrigation is still by far the most predominant method used. Where traditionally growers used to “start and throw” syphons, bankless irrigation, syphons through the ditch, and other methods are rapidly becoming more popular due to their ease of use and reduced labor needs. It was, while looking at some phone apps that accompany these new flood irrigation methods, that I got to discussing the plethora of new technologies, apps, and platforms that seem to get released every day with one of my grower friends. In agriculture, the collection of data was one of the most discussed topics in 2017, and rightfully so. As without data, we don’t know what is happening; if we don’t measure it, we can’t fix it either. But I think that this is also where some of the issues start to appear. Sometimes we simply want to collect too much data and some of it is just clouding other, more important, data. Having too much data can also lead us down the track of analyzing the wrong data set and not get the best results we could possibly get. Another inherent problem with collecting data is determining where to collect it. Too often I see growers collecting data on a plethora of platforms. They might be good and useful platforms, but they act as standalone databases and don’t allow for cross-checking with data on other platforms or performing regression analyses on a wider set of data. A simple example of what I often see is growers collecting geospatial data on one platform and do farm-recordkeeping on another app. As soon as we get to talking about creating dynamic profit maps, the problem with using two separate systems becomes very obvious. In Australia, we are very fortunate to have a government that is supportive of innovation in agriculture at the moment. There is lots of funding available for research organizations, incubators, and start-ups, to just name a few, which is provided by a variety of research and development cooperatives, the federal and state governments, and a range of other organizations. Some of the buzzwords seen everywhere in combination with start-ups are “data collection,” “analysis,” and “new platform,” and while these can be very beneficial and some of the new technology created is excellent, we, as the agricultural sector, are also creating some issues by doing this. I have recently seen a range of start-ups talking about creating a platform for their specific service where growers can store some specific data and then have this company provide them with their service related to this data. But, seeing that grants, seed capital, and other funding is available from a lot of different directions, why aren’t we, as the agricultural community, investing in a common geospatial data platform? A single platform that can hold any range of geospatial data, owned by the grower, and for which any company can develop apps or other software to work from, would prevent a lot of issues in the future. Having data in separate “silos,” owned by different entities and organized differently, will always bring challenges when companies cease to exist, want to merge their datasets, or in any range of other situations. With the IOT age only just having come to Australian agriculture, the true collection of big data has barely started. If we want to be able to organize it so that we set ourselves up ready for the future, now is the time. One single, open source, well organized, and secure platform would set Australian agriculture up as a world leader in data collection. The one aspect that sets agricultural data apart from most other big data is that it is geospatial. Seeing that the geospatial location of data is important and hard to hide while keeping the data useful, means that it is very hard or impossible to anonymize this data and therefore data security is a very important issue. When trying to get a large amount of data stored securely, what is going to work better: a plethora of separate databases managed in all different ways and with different levels of funding, or one central database with good industry funding and best practice security systems applied? Then the other remarkable recurring feature that I notice a lot at the moment, is new start-ups offering data analyses and conclusions, without worrying about how a grower can translate this data into a tangible crop-management decision. NDVI is a great example of a data source of which there is plenty available, with more and more satellites with multi-spectral cameras getting launched every day, offering near real-time imagery to growers. But just because a lot of data is available, does not mean that every bit of analysis on it is going to be valuable. As a general rule, growers tend to expect a 5 to 1 return for every expense in relation to growing a crop. This also goes for investing in analyzed data products. So businesses that offer information or analyzed data that doesn’t provide the ability to influence decisions and ultimately lead to an improved bottom-line will struggle to get farmers interested. In order to keep growers and other industry people interested in new technologies, it is important to not lose sight of the fact that a service or product has to be useful, not just interesting. In short, I think it is great to see a lot of innovation happening and many people are working day and night to develop the new “Uber of Ag,” which is the kind of dedication we all need and benefit from. However, it might pay to, as an industry, strategically evaluate which basic tools such as a database or platform, we want to develop together, fund together, and manage together. This will prevent start-ups having to reinvent the wheel constantly and it will help agriculture in general by not having to help fund every start-ups new platform or database (either through grants or user fees, the grower always pays for this). Having such an infrastructure in place, will lower the entry threshold for innovators by being able to use an open source database and merely having to create their software or app to work on this common platform. Then finally, the aim of big data is the ability to have a large amount of data available and use it to the advantage of everyone involved. Only when this data is on one single, common platform, will we have the opportunity in the future to let the data work for us to provide us with opportunities we haven’t even dreamed of yet. For more information, feel free to contact me on [email protected]. Reinder Prins, originally from The Netherlands, is Marketing Manager for Agworld and based in Perth, Western Australia. Prior to this, he was precision ag adoption lead for an ag retailer focused on the cotton industry on Australia’s east coast. He then moved to South America and worked as a freelancer in the space of digital agriculture, before returning back to Australia. 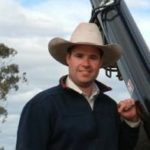 He has in-depth knowledge of the precision agriculture landscape through working with some of the largest growers in Australia and also with a range of service providers spanning multiple continents. See all author stories here.